The Masterpiece features two layers of nested springs; a hand teased filling of Real Shetland Wool, European long stranded horsetail, cashmere, alpaca, bamboo and cotton; and five rows of side stitching that will have taken six hours to sew by hand. The Masterpiece is shown with the Eccleston headboard. 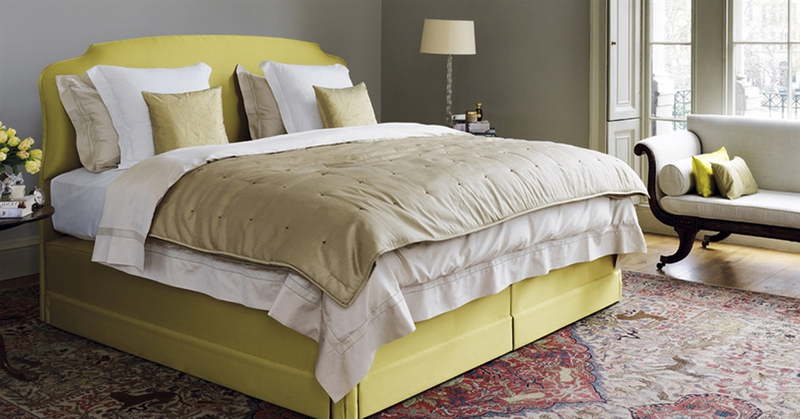 Divan and headboard are upholstered in Imperial Gold silk. Vanadium wire springs, 1.93 inches (49mm) diameter, sewn into individual calico pockets and hand formed into a honeycomb nested unit. Constructed with two layers of springs. 9.8 inches (25cm) deep with five rows of genuine hand side stitching. Eight horizontal handles on Queen Size and above. Air vents on all sides. Border edges upholstered with coir and wool, finished with piped ticking. Upholstered with 0.7 oz/ft2 (200gsm) cashmere, 0.7 oz/ft2 (200gsm) alpaca, 0.7 oz/ft2 (200gsm) bamboo, 3.0 oz/ft2 (900gsm) blended real Shetland fleece wool and cotton, 2.2 oz/ft2 (610gsm) hand opened and hand teased Mooseburger long stranded horsehair, 2.2 oz/ft2 (610gsm)real Sheland fleece wool overlaid with 3.9 oz/ft2 (1,200gsm) blended real Shetland fleece wool and cotton. Finished with a sensual silk Damask for the ultimate in luxury. Hand tufted with hand tied woolen tufts and twine. 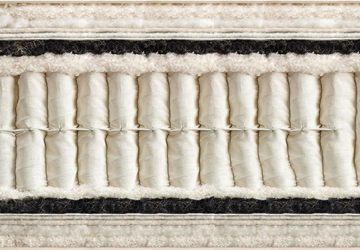 The Masterpiece mattress features two layers of superbly responsive Vispring nested springs.